Superman is arguably the most famous and recognizable superhero in the history of the genre. With virtually limitless powers, a boy scout ethic, and the most ingenious disguise in all of comic books, the Last Son of Krypton has been delighting comic book readers, moviegoers, and television junkies since his introduction in 1938. Merchandising options for Clark Kent's alter ego have never been in short supply and for that reason there are hundreds of different Superman items worthy of collecting. For the sake of this guide, we will keep things limited to the types of collectibles one could uncover at a comic book convention but, in general, collectors of the Man of Steel can find jewelry, lunch boxes, china sets, and even perfumes adorned by the iconic “S” logo. For those wishing to dig a little deeper, our article on the Top 10 Superman Collectibles may also be of interest to you. Created by Jerry Siegel and Joe Shuster and premiering in Action Comics #1 in 1938, Superman was sent to Earth by his parents — Kal-El and Jor-El — as their home planet of Krypton was on the brink of total destruction. Crashing onto a farm in Kansas, the alien baby was adopted and raised as a wholesome, mid-western boy, not aware of the effects that Earth’s yellow sun were having on his body. Later moving to Metropolis as Clark Kent, mild mannered reporter for the Daily Planet, Superman eventually realizes his powers and becomes the greatest superhero of all-time. Much like Batman, Superman has a cast of supporting characters with a pop culture familiarity rivaling the hero himself. Lois Lane, Jimmy Olson, Perry White, Supergirl, and Lex Luthor are all long-time cohorts of the Man of Tomorrow and have always played a critical role in the Superman mythos. 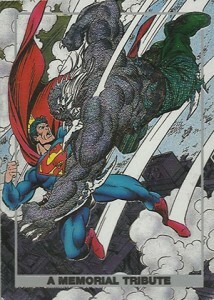 In the 1990s, DC Comics did the unthinkable and announced that they were going to kill Superman at the hands of the monster Doomsday. This was the peak of gimmicky sales ploys in the comic book industry and merchandise related to the death and return of Superman is plentiful and of varying degrees of quality. Thanks to the long-running show, Smallville, and the successful reboot of the film franchise starring Henry Cavill as the titular hero, Superman’s popularity has endured and broadened. The iconic words, “look, up in the sky…” are as powerful and evocative now as they ever were. In order to assist fans in this super collecting task, the tabs above highlight the key avenues to pursue, including notable comics, trading cards and figures. There’s not a soul under Earth’s yellow sun that doesn’t know the value of Superman comic books. When a pristine copy of Action Comics #1 sells at an auction, it makes big news. Because of this incredible value, anyone who has rummaged through a box of comic books at a garage sale has held out hope of finding their future retirement wrapped in plastic and in mint condition. There are, though, several comic books one can look for that won’t cost $3 million to acquire (that number is not hyperbole, as you’ll see later). 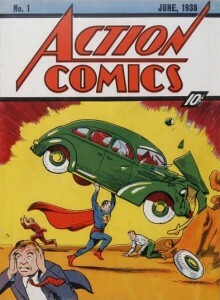 Action Comics was the premiere comic book of Superman and had an original run of 906 issues, the only comic to reach that level. Rebooted in 2011, Action Comics has been in regular publication since 1938 and has produced some of the most iconic stories in comic book history. Because of its age, any big anniversary issue has potential value as it would be the first to hit major milestones. Further, character or super power premieres can have increased value as well with issues like #23 introducing Lex Luthor and issue #13 giving Superman the power of flight. While it is unlikely that you will collect a full run of Action Comics, it is possible to compile a nice collection of these books with a smattering of higher-value issues. This book can be a little confusing to figure out so stick with me so you don’t get roped into buying something you don’t want. The original Superman, released a year after Action Comics in 1939, ran for 423 issues until 1986. 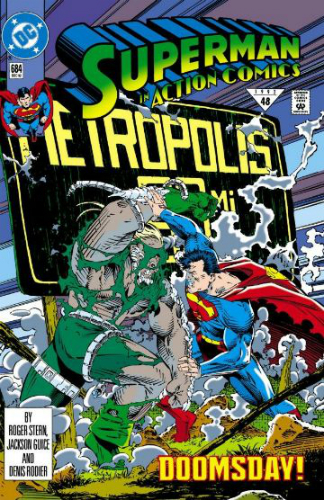 At that time, this comic book was renamed The Adventures of Superman and ran from issues #424 to #649. 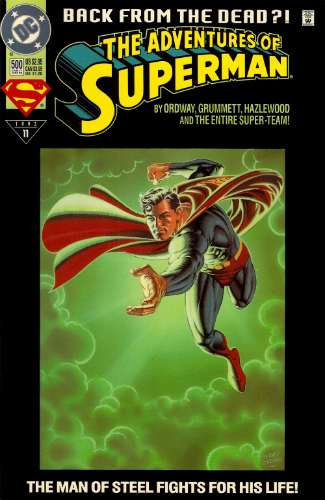 For issue #650, the title of this book was once again renamed Superman and remained so until its final issue (#714). The confusing part is still coming, though. While this book was titled The Adventures of Superman, a second volume titled Superman was released concurrently for 226 issues. Got that? Now, throw in the New 52 reboot and there are three different Superman #1 issues to find with one being issued alongside the original comic book. While it might not be the most straightforward title, there are some very famous issues in this series. Collectors should be able to track down some cool pieces without breaking the bank, although the important issues will still run you several thousand dollars. SUPERMAN'S GIRLFRIEND LOIS LANE #18, "VG+"
SUPERMAN'S GIRLFRIEND LOIS LANE #16, "VERYGOOD"
SUPERMAN ANNUAL #3 (4.0) THE STRANGE LIVES OF SUPERMAN! Superman 148 VG SKU14004 25% Off! Superman has been one of the lucky few comic book heroes to be presented in trading card sets devoted entirely to his story while also appearing in virtually every DC Universe set as well. Cards have been released to commemorate television shows, films, and iconic comic book story arcs. 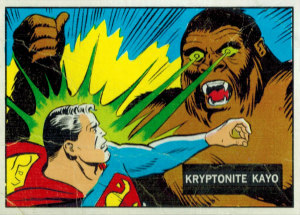 The peak of trading card sets were released during the junk wax era but, as documented in the Top 10 Superman Card Sets, some of the chase sets from these collections have become valuable irrespective of their base sets. 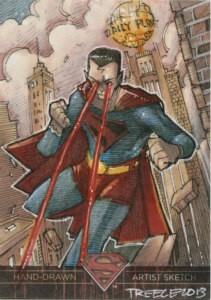 Further information can be found in a more detailed breakdown of Superman Trading Card Sets. 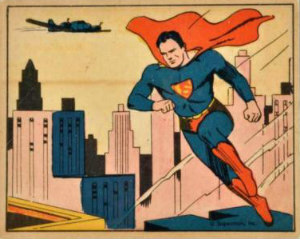 In 1940, just a few years into Superman’s existence, Gum Inc. released a set of 72 trading cards featuring comic artwork from the Golden Age of comic books. Cards #49-72 are considered short prints and are considerably more costly. Overall, a set of these cards will cost you thousands of dollars but it is a worthwhile investment for your collection. Topps began their production of Superman cards with a 1966 set based on the George Reeves television program from eight years prior, and again in 1968 with Superman in the Jungle, which has become one of the most rare Superman sets ever. The company, most famous for baseball cards, continued in the 1970s and 80s by producing card sets commemorating the Christopher Reeve films, including 1978 Topps Superman the Movie. Their final was based on the 2006 Return of Superman film, featuring the incredibly valuable autograph of Kevin Spacey as Lex Luthor. During the 1990s, Skybox was the master of comic-based trading cards. Superman appears in several sets devoted to the DC Universe and is featured in his own sets geared to comic books and the popular '90s television show, Lois and Clark. The Death of Superman (1992) and Return of Superman (1993) sets feature artwork from the iconic comic book story arc while The Man of Steel Platinum, a set of over-sized cards, tells the entire story from Superman’s birth on Krypton right up to modern day. Hobby boxes can still be found online, often at contemporary prices, but some of the chase cards from this era are incredibly rare. Cryptozoic has filled the void left behind since Skybox left the market by releasing DC sets as well as Superman exclusives such as 2013’s Superman: The Legend, and the final set devoted to Smallville (2012) which they produced after original series card producer — Inkworks — went out of business. If you’re hunting for sketch cards, autographs, or costume relics, Cryptozoic is going to be the perfect place to begin. The return of Superman trading cards 1993. New sealed packs. Some loose. Skybox. The Man of Steel has been an action figure for as long as there have been action figures and a collector would be hard pressed to think of a time there wasn’t a Superman figure on the market. Beyond the obvious collectibility of action figures, there are also the many statues and stationary figures that have been released in his likeness, many of which have become quite valuable in their own right. Mego was the first manufacturer of licensed superhero action figures and Superman was released in the inaugural series. 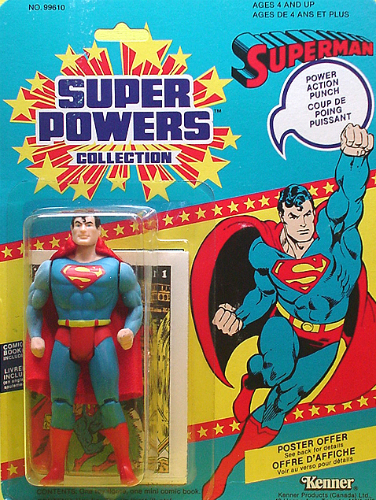 Between 1972 and the company’s eventual bankruptcy in 1983, Mego released several variations of the figure in various production lines, including World’s Greatest Super Heroes (1972), Secret Identity (1974), Comic Action Heroes (1975), and the Superman Movie (1978). 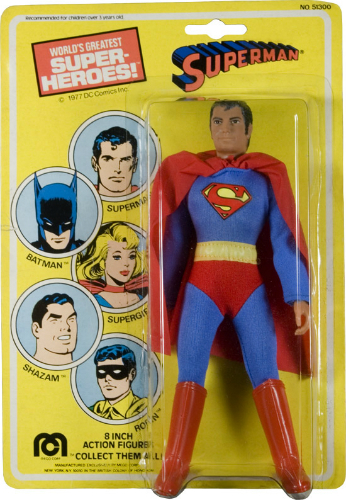 Variations in costume, packaging, branding, and accessory inclusion, as well as packages from other countries, have made Mego Superman figures a fascinating and difficult collection to compile. Kenner produced one of the most famous action figure lines of all-time throughout the 1980s with their Super Powers series. Superman, included in the first wave of production, was a constant inclusion in this line and a 12-back edition of this figure can cost several hundred dollars. There are some packaging variations and there have been some reissues as well, so collectors must pay special attention to know they are buying an original figure. 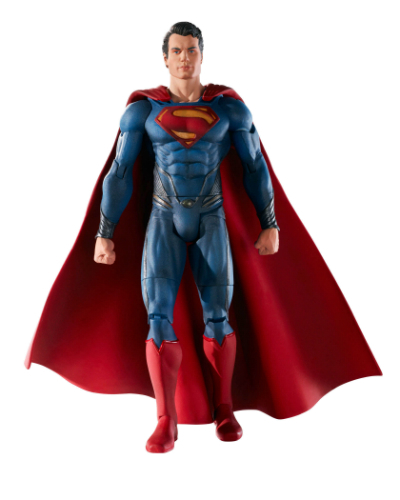 Mattel has released figures based on comic books, cartoons, and films, including Man of Steel and Batman vs. Superman. Because of their recent releases, their value is not particularly high and figures are fairly easy to track down. These figures are the most detailed and impressive molds to date and are sure to appreciate over time just like their vintage counterparts. However, be mindful of limited releases, comic-con exclusives, and retail exclusives as you attempt to compile your collection. There have been dozens of statues sculpted in the likeness of Superman. Many of these sculpts are limited edition, scale renderings that have become very hard to find and incredibly valuable. Ranging in detail, material quality, and originality of sculpt, it is possible to enter into the statue collection market for $100, give or take, with Kotobukiya figures. The next level up is Sideshow figures which consistently sell for several hundred dollars and have been known to crack into the four-figure range. These statues retain their initial value and regularly appreciate at a rapid rate but, more importantly, they look awesome in your display case. 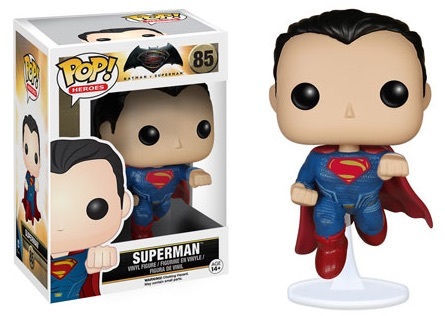 As with virtually every other pop culture figure, Funko Pop has many vinyl figures devoted to Superman and his cast of characters. Probably the rarest of these figures, the Silver Superman, is limited to 144 figures and consistently sells for $500+ via online auctions. There are also figures created for the Batman vs Superman film, often sold in two-packs with Batman, and a Mystery Minis version. Eventually all these figures will retire and the constantly expanding selection of figures makes it impossible for stores to keep every figure on shelves. This is what makes Funko Superman figures an intriguing collection to chase. Funko Pop! Heroes - Batman vs. Superman - Glows In The Dark!